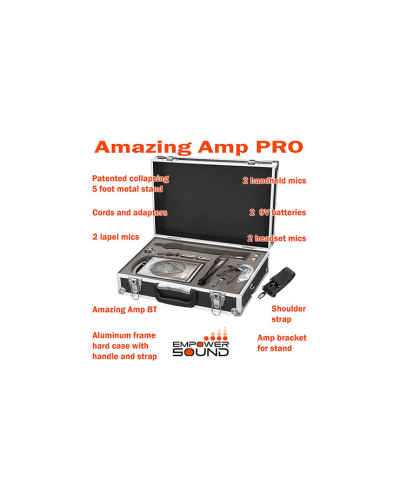 Amazing Amp Pro is the next generation of Amazing Amp and Happie Amp. What makes Amazing Amp Pro unique? 1. You get everything you need! No need to try to select microphones or find a case or stand. It is all there and for less than the typical cost of a speaker. 2. Set-up in 60 seconds with no electrical cables or wires needed. 3. Patented stand design allows our 5-foot-tall stand to collapse to 19" and fit in the case. 4. UNLIMITED warranty available -- covers everything for every reason, with no deductible and no waiting for repairs! 5. Ready to go. You could receive your order at an event and be using it 60 seconds later. 6. Use one of our transmitters to make your music device (CD player, mp3 player, projector) wireless. 7. Add a second speaker without any wires or work. Turn it on and your voice is coming from both speakers. 8. 2 wireless channels! 2 people can be mic'ed at the same time. 9. 5-pound speaker can reach 400 people indoors. 10. Receivers are built in. No need to carry extra components. 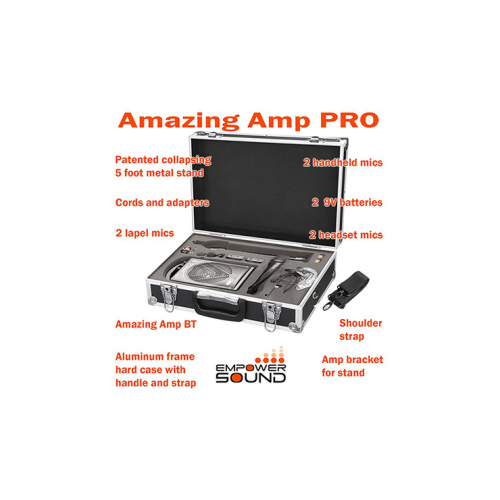 It's no wonder Amazing Amp is the #1 Portable PA System for entertainers, public speakers, and wedding officiants.